In the past week the war of the ear grabs has continued. Sadly, Martin seems to be getting soundly defeated by his brother in battle after battle. He has lost the morning pajama battle. He has lost the late afternoon battle. Presumably Martin is on the receiving end of some ear-grabbing going all through the night as well. On Wednesday night, in the midst of all this back-and-forth, I found some time to snip all the Brussels sprouts off the stalks, season them, and toss them in the oven. I put Martin in a Baby Bjorn and sung him a song I wrote called "Cutting the Brussels Sprouts Off The Vine." I know it's not really a vine but it worked really well within the context of my song. I also boiled some of the farm potatoes and tossed them with butter, olive oil, chopped parsley, salt, and pepper. 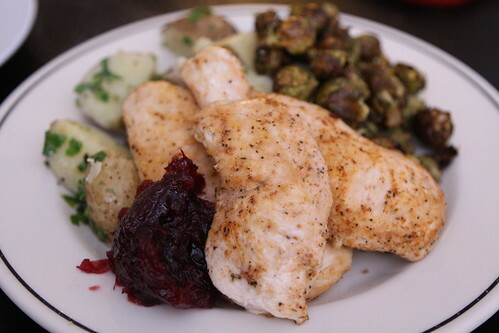 I served them up with a little more of the bacon cranberry chutney. 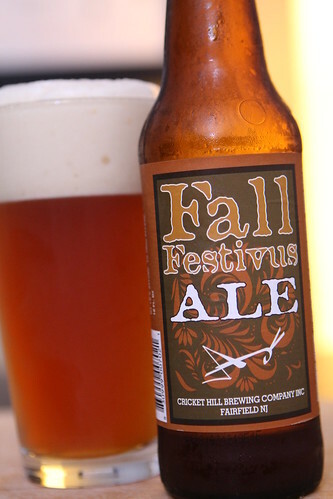 For beer I poured this Fall Festivus Ale from Cricket Hill Brewery. This beer was completely different than I'd expected. It was excellent. I am increasingly impressed with beers I try from Cricket Hill. All of their stuff seems to be really good. This beer was more like a really, really nice IPA. I had been expecting something sort of malty but this was just a really, really nice IPA. I dare say it reminded me a bit of Pliny the Elder. I just hope no beer snobs read this and then attack me for the sacrilege I just spouted! 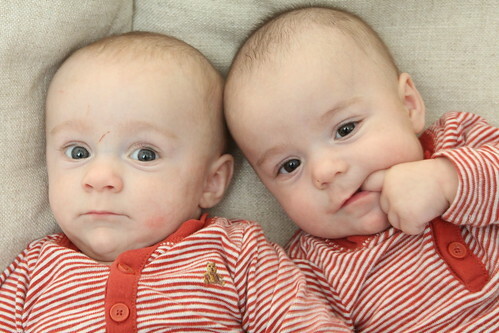 On Thursday we got a call from daycare saying that they suspected that Elliott had conjunctivitis. This meant that on my way home from work to pick them up I had to bring both of them to the urgent care clinic and get Elliott inspected. Jen and I had talked about how the daycare didn't know what they were talking about and that we'd just get a note clearing him to go back to daycare on Friday. There was no way he had conjunctivitis. After a quick inspection the doctor revealed that Elliott had conjunctivitis and an ear infection. Boo ya! Jen and I were right! He didn't have conjunctivitis only! Being right is such a great feeling. Another great feeling is the praise that was showered on me by every single woman that worked at the urgent care. 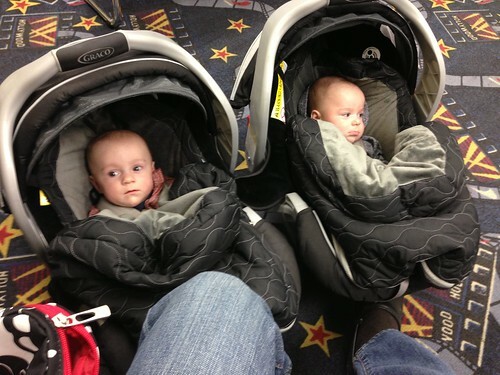 They could not believe I was wrangling these two babies by myself. I was the talk of the medical facility. I'm pretty sure one of the nurses even slipped me her number. Sadly I think this is only because it is assumed that men are stupid, inept buffoons when it comes to childcare (and most other things). I doubt any of them would have even batted an eyelash if Jen had showed up with both of them by herself. After dropping Elliott off at home I went out and picked up the prescription from amoxicillin. Since Jen is highly allergic to amoxicillin we watched Elliott very carefully over the course of the evening but he seemed pretty happy apart from spitting out most of the amoxicillin all over me. Or maybe he was happy because of that. 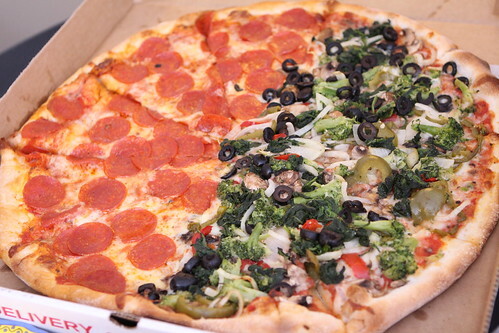 After a very long day we did something we haven't done in about six years and orderd a pizza to be delivered. It felt very retro except that we ate it with babies on our lap which is sort of new. 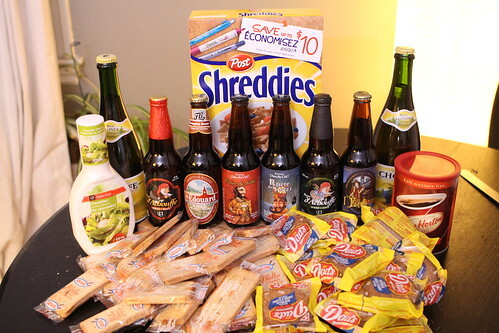 Last night Jen's father popped in on his way back from Canada to shower us with gifts of Canadian foods. He may, also, have wanted to visit the Wombats. 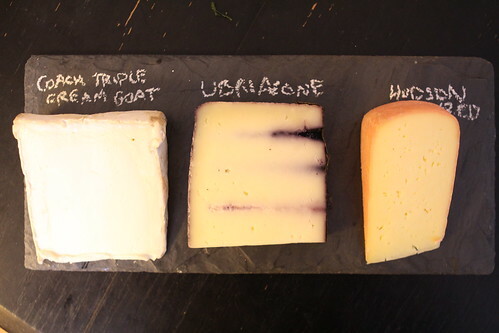 I repaid the favor with dinner starting with a nice cheese plate of Coach Farm Triple Cream Goat, Ubriacone, and Hudson Red served with lemon garlic olives, crackers, bread, Marcona almonds, and sliced salami. 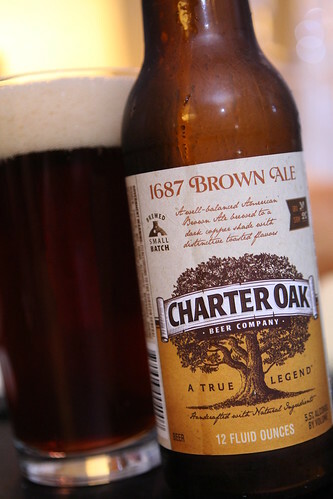 As a pre-dinner warm up I poured this 1687 Brown Ale from Charter Oak Brewing Co., a new brewery out of Connecticut. It was an very nice brown ale which paired well with the cheese selection, particularly the creamy goat cheese. 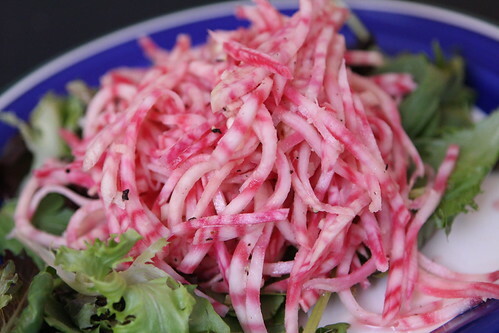 As a salad I used up the giant Chiogga beet from the farm, julienned it on the mandolin, and tossed it with rice wine vinegar, sesame oil, and pepper. 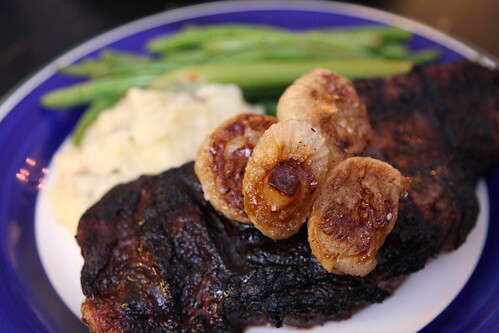 For the main course I grilled up some New York Strip Steaks and served them with caramelized ciopollini onions, green beans with garlic and butter, and mashed farm potatoes with truffle oil. 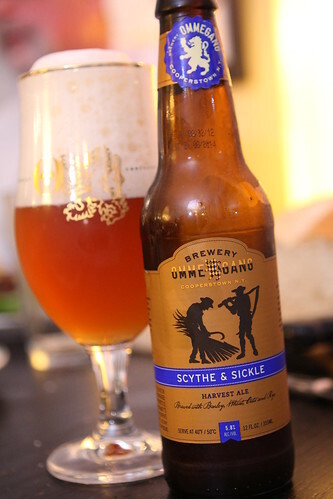 Along with dinner I served up this Scythe & Sickle Harvest Ale from Brewery Ommegang. This was another fall beer that was not at all what I was expecting but was incredible. This was a classic Belgian-style ale with all the flavor of a beer with twice the alcohol by volume. I was extremely pleasantly surprised by this one but, of course, I have never had a beer from Ommegang that I did not thoroughly enjoy. 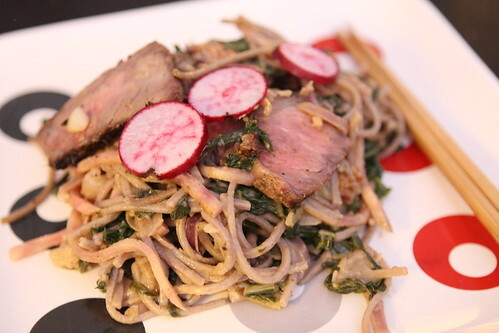 For dinner I used leftovers from the last few nights to make this noodle dish with sesame oil, garlic, ginger, onion, bok choy, slices of New York Strip, Chiogga beets, peanut, soy sauce, rice wine vinegar, and radishes. 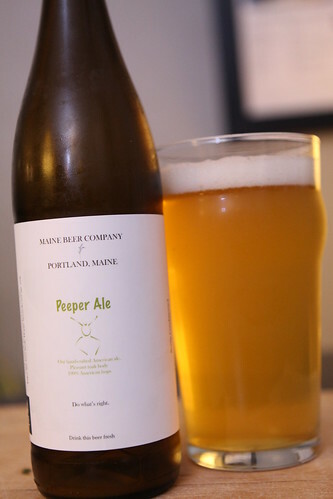 To accompany this unholy combination of leftovers I poured this Peeper Ale from Maine Beer Company. Jen had got me this beer as a gift for taking care of the guys while she was at work. This keeps with the theme that mothers are expected to take care of babies thanklessly and that fathers are big dummies. I don't mind any kind of insult to my character so long as there is a present of delicious, free beer. 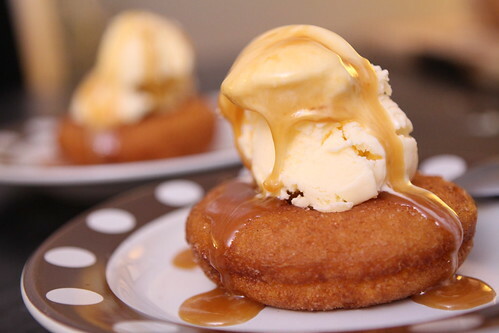 To cap off the evening I took some of the cider donuts from the farmer's market and made a sundae out of them with vanilla ice cream and caramel sauce. We would have also capped off the evening with a little television except for that the guys took an amazing late afternoon nap and have very little interest in sleeping now. Instead Jen is putting away laundry while I rock Elliott with my foot and write this blog entry. The babies slept until 4:00 AM last night and then had a few other stretches which meant we got to nap until a little after 8:00 this morning, a rare luxury. If they can give us half that tonight I'd say we are getting off easy. Of course the concept of "easy" has been relative these last few months. Well deserved praise from the nurses as you are one of the best Dads!!! Love the pics of the babies and the food.